Glitz and glamour returned to Ponte Carlo as ladies flocked to the West Yorkshire track in their finery to try to win the Best Dressed Lady competition on the annual Ladies Day. Generously sponsored by RIU Hotels and Resorts, the winner received an all-inclusive week long holiday for two to The Dominican Republic. Judged by representatives from RIU, along with Dixie and Emma from Heart Breakfast, the competition was won by local racegoer Lisa! The gents did not miss out either as the course also had a Best Dressed Gent competition with a cash prize of £350 to the winner. On course, the feature 1m4f tiesplanet.com Handicap was won by Bolder Bob. The crowd roared the son of Big Bad Bob home in the most thrilling finish of the day. Having being taken down to post early by jockey Ben Curtis the gelding was slowly away and last for most of the race. Making headway in the home straight he joined the two leaders before forcing his nose in front right on the line. Only a head separated the three runners at the end. Classic Pursuit notched up a three timer in two weeks for trainer Michael Appleby over the flying five furlongs. Making all of the running, the gelding was strongly pressed inside the final furlong but found his second wind to go clear by 1½ lengths on the line. The opening Samantha Kerley Birthday Handicap Stakes over the 1m2f trip went to First Dance for Tom Tate and Patrick Millman (whose father Rod Millman trains in Devon). The 25-1 winner caused a bit of a shock as he got the better of the short priced Final Rock for the Sir Mark Prescott team. Paul Hanagan is always popular with the Ponte crowd and he took the two-year-old race aboard Ventura Ocean. The colt was sent off 11/8 favourite, made all of the running and was pushed clear over the last furlong. The colt has an entry for the Group 2 Gimcrack at York on 24th August for Malton trainer Richard Fahey. Brian Ellison loves a winner at Pontefract and Little Jo took the one mile contest in impressive style. 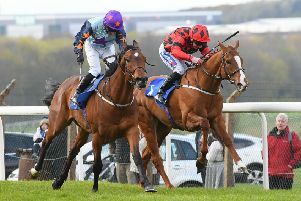 With talented 3lb claimer Ben Robinson aboard, the four-year-old was produced into the race one furlong out and went away strongly to win by six lengths. Andrew Mullen took the final two races of the day, winning on Pumaflor and Arcavallo. Now trained by Philip Kirby in Richmond, Pumaflor last won at the West Yorkshire course back in 2015 but bounced back to form to take the RIU Hotels and Resorts Veterans Handicap. Mullen completed his double aboard Arcavallo by 3 ¾ lengths. The horse really seemed to appreciate the stiff uphill finish that Pontefract is renown for and, having been a talented two-year-old, seems to be getting his career back on track after this performance.